Jain Irrigation -- widest selection of micro-irrigation products. Jain Irrigation, Inc. is a manufacturer of quality drip irrigation products for the agricultural, turf, greenhouse, nursery, industrial and landscape markets. We specialize in the design, installation and service of Customized Irrigation Systems. If you can dream it, we can design it! Raindrip, Inc. (a subsidiary of NDS, Inc.) has been a leader in efficient irrigations solutions for the residential market producing innovative products such as the WeatherSmart Pro smart irrigation timer and the new SimpleDrip 1-2-3 Conversion System. Magnation Water Technologies offer powerfully elegant and clean solutions to improve water and energy efficiency, soil and plant health, reduced fertilizer and chemical use. ErfGoed BV -- Cultivation floors ... A healthy uniform crop! An ErfGoed cultivation floor is the result of years of experience & extensive research to develop a floor that a grower can rely on to eliminate problems. Decagon -- measuring water, light, heat in soil-plant-atmosphere continuum. HortiMaX -- Offering more than just Better Results. HortiMaX provides both basic and high-tech solutions to horticultural operations of all sizes, in over twenty countries. Flexzilla (Legacy Mfg) -- Premium Hoses, Cords & Attachments. Legacy’s Flexzilla® ZillaGreen™ premium hybrid polymer garden hose is made for extreme all-weather flexibility. It will not kink under pressure, is lightweight, drinking water safe & features the SwivelGrip™ that connects easily to spigot or attachments. Gilmour is an innovative developer and manufacturer of four full lines of American-made lawn and garden products. 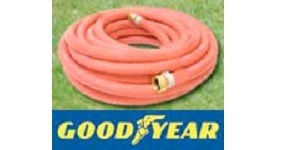 Contractor/Landscaper water hose. Safety red color. Flexible even in extreme temperatures. Machine brass fitting with steel bands. Every watering consumer is a little different. Applications vary widely, and so do tastes, preferences and price sensitivities. Nelson has always striven to understand these needs. Teknor Apex -- One of the major manufacturers of garden hose in the U.S.
High quality garden hoses with the features and benefits that consumer's demand. The standard Apex® line of garden hoses features a variety of duty's that meet all your watering needs. Spectrum Products Inc. manufacturers and distributes Treegator and TreegatorJr Pro slow release watering bags. Beautify your garden with the perfect round border. Planting Rings produce larger, healthier shrubs, trees and vegetables because water is funneled to the Deep Root Zone.